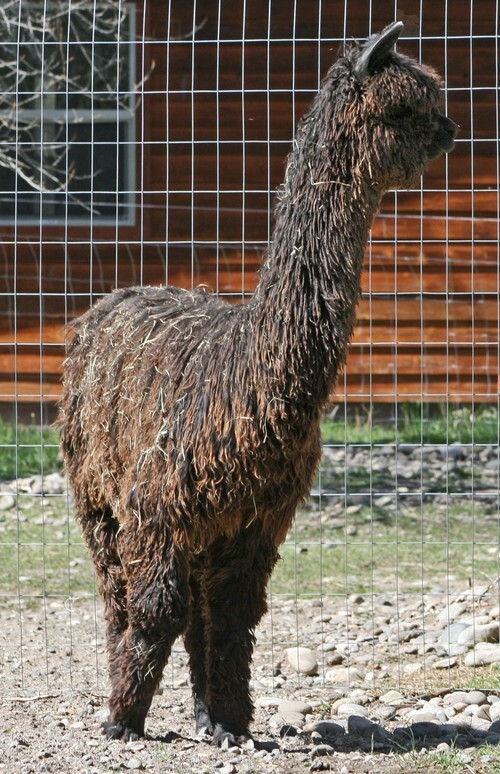 Openherd: Spanish Peaks Alpacas LLC is a farm located in Manhattan, Montana owned by Evi Dixon. SHIP, Shearing, Handling of Alpacas, etc. One of many of the best! Thank you for finding our farm on Openherd. We would be happy to take you on a tour around our land and pastures. It is a very relaxing place between tall Cottonwood trees and open sunny pastures. Baker Creek delivers the soothing music with its relaxing flow. Our alpacas are roaming over a bridge to the other side of the creek, very often they stop and watch the water flow beneath them. My 5 year old granddaughter loves to visit our herd. Sometimes she uses their sand to play with her sand toys, sometimes she helps spread the hay and the grain, sometimes she just talks to them. They are used to her and have never thought about kicking her. We can often see all the boys and girls watching her dance. Alpacas make us happy! Bring your kids and relax with our Suri Alpacas. 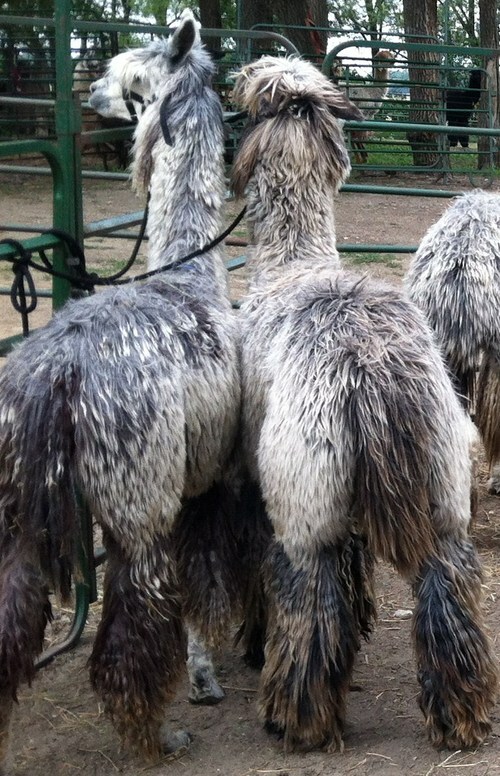 This is the only Ranch in Montana that houses wonderful gray (silver gray and rose gray) Suri Alpacas! We also have white, fawn, dark brown and black Alpacas. Please feel free to contact us, we will be happy to help you out anyway we can. Financing is available, packages, help with transport, setting up fences, handling the alpacas etc. 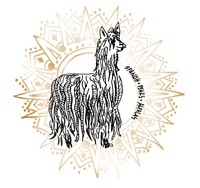 Our Suri Alpaca Farm is located on Baker Creek 20 minutes west of Bozeman, Montana, 15 Minutes from YELLOWSTONE NATIONAL PARK INTERNATIONAL AIRPORT. Many Attractions are in our vicinity which include YELLOWSTONE NATIONAL PARK, the LEWIS AND CLARK CAVERNS, MUSEUM OF THE ROCKIES, and many more. For your vacation planning: We are about 1 hour away from BIG SKY RESORT the biggest skiing in America, with golfing, horseback riding, zip lining, fly fishing, and so much more! Yellowstone National Park is only 2 hours away from us. We can help with your financing. For example: 20% down payment with 0% Interest for 2 years. TROUBADOR is in the upper 3-5% EPDs for fineness and density. 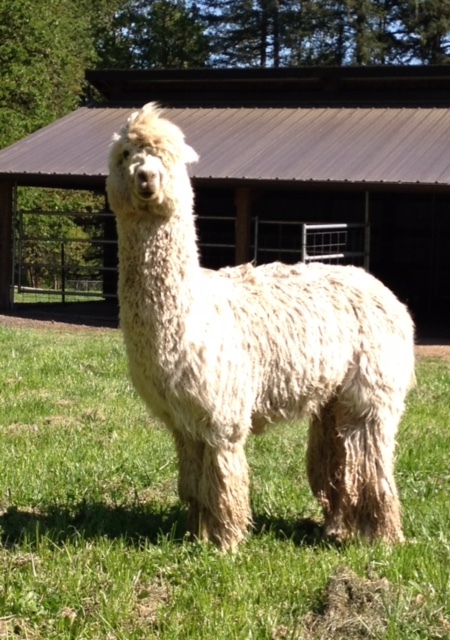 He will definitely be able to improve your female Suri alpacas with his genes! He is full Accoyo and 3/4 Peruvian! Reserve your breeding for next spring now! CAMELIDYNAMIC SENIOR CONSULTANT: I also offer Camelid handling help. 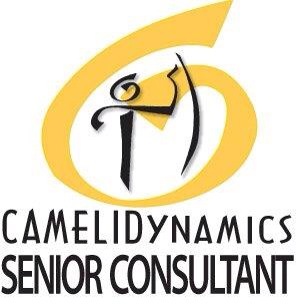 I am a Senior Consultant for Marty McGee Bennett's Camelidynamic.